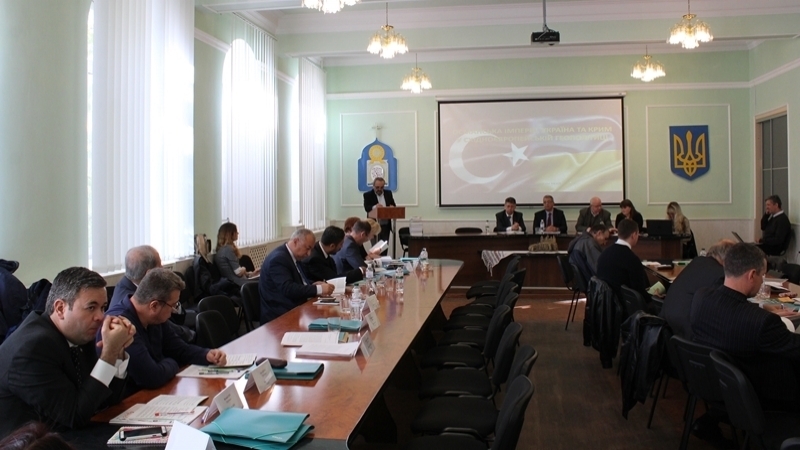 October 15 to 17, the Ivan Ohienko National University of the city of Kamianets-Podolskyi hosted the international scientific conference "The Ottoman Empire, Ukraine and Crimea in Eastern European geopolitics". A special feature of the conference was the participation of scientists from the Turkish Republic, which indicates the expansion of the international ties of the Ukrainian university, the dean of the historical faculty Vladimir Dubinsky stressed in his opening speech. This year the conference was divided into four major blocks: "Cossack Ukraine in the geopolitical interests of the Ottoman Empire", "The role of Crimea and Turkey in international relations in the Eastern European region", "Turkey, Ukraine and Crimea at the crossroads of Eastern European geopolitics" and "Problems of economic and social political life in the context of geopolitical confrontation in Central and Eastern Europe ". Within each of the blocks, discussions were held among Ukrainian and Turkish historians. According to the Head of the Institute of Turkic Studies of the Turkish Sakarya University Yücel Öztürk, the participation of representatives of the Turkish scientific circles in this conference was not accidental, but is the result of long-term scientific work, which was presented at the conference. It is worth noting that the conference was held immediately after the official visit of the Turkish President Recep Tayyip Erdogan to Ukraine, which was accentuated by Ivan Konet, the Professor of the Ukrainian University named after Ivan Ohienko. Ambassador of Turkey to Ukraine Yonet Can Tezel took part in the opening ceremony of the conference. Cultural program was also prepared for the guests from Turkey, and included excursions to Kamianets-Podolskyi and Khotyn. Just the day before the conference, Turkish scientists met with the leader of the Crimean Tatar people, People's Deputy and Presidential Commissioner of Ukraine for Affairs of the Crimean Tatar People Mustafa Dzhemilev.